Matthew Henson, was in the team led by Captain Peary, who were the first Americans to reach the North Pole in 1909. Yet he is not a household name at all, and did not receive a medal even though the other team members did, and this appears to be because he was an African American. This slim book tells his story in very accessible prose and is beautifully illustrated along the bottom of every page, by Katie Hickey. 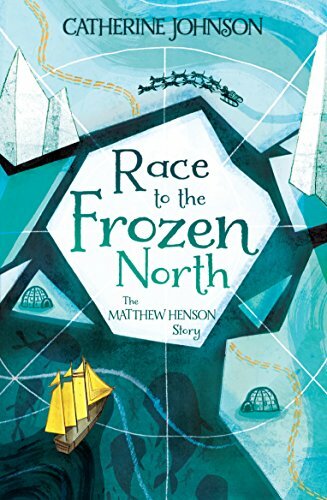 Matthew came from a bad home, beaten by his step-mother and ran away, found a home working in a café in Washington DC, listening to tales of daring do and is then determined to sail the seas himself and find adventure. By chance he met a sea Captain who takes him under his wing and teaches him to read and write and many other useful skills. This eventually led to him being part of Captain Peary’s team who made several attempts to reach the North Pole. What emerges from this brief fictionalised account of his life, is the drive that led him to find a better life, to learn as much as he could, and also his quiet acceptance that because he was black, he would be treated in a certain way by most white Americans. It is that realisation that the colour of his skin did not deter him from striving to learn and fulfil his dream, which makes this an extraordinary story. It is simply told but the bones of his life are there within the 118 pages. For many boys this will be prove to be an inspirational story.